» Refrigerants with a very high global warming potential (GWP) may only be used on a limited basis. » Refrigeration systems that are filled with HFC refrigerants are associated with high environmental and financial risks. It is worth investing in sustainable alternatives. » Construction opportunities and passive solutions are available, though greater collaboration between architects and energy designers would be required to implement these. The summer of 2018 blessed us with bright sunshine and high temperatures. This was frequently welcomed by holidaymakers and people whiling away their free time outdoors – yet for building occupants, spending extended periods of time in enclosed spaces such as offices or even your own home can become increasingly unpleasant as temperatures rise. The calls for air-conditioned buildings are rapidly growing in number, while it also remains crucial to ensure the provision of continuous refrigeration for foodstuffs and other goods. Although air conditioning and refrigeration units can satisfy these demands for cooling, the use of such systems that require refrigerants for operation can also come with negative consequences. » Many people think that a bit of Partially fluoriated refrigerant won't make any hydrocarbons or difference. Yet across the globe, hydrofluorocarbons HFCs are responsible for almost (HFCs ) generally have as many emissions as air traffic. « a high global warming Dr Daniel de Graaf, potential. Despite this, German Federal Environment Agency they are still frequently used as a refrigerant in all too many refrigeration and air conditioning units or heat pumps, for example, in spite of the alternatives available and even though their use represents a risk for market players (see page 6). Consequently, HFCs with particularly high global warming potential should be reduced or replaced. To this end, by 2030, the quantity of CO2 equivalent of HFCs (and consequently its contribution to global warming) is set to be limited in stages by around 80% in comparison to the initial quantity established for 2015. This "phase down" is one of the key implications of the European F-gas regulation that has been in effect since 2015. The regulation constitutes part of the climate protection measures taken by the European Commission and also contributes to climate protection on an international level. Against this backdrop, in order to begin designing and building sustainably from now onwards, the DGNB wishes to provide information to building owners and designers on the use of refrigerants, having already organised an information event in Berlin in June 2018. The findings of this event are summarised in this publication. In addition to the refrigerants used, the energy consumption involved also contributes to CO2equivalent emissions (perhaps to an even greater extent). The electricity that is consumed by air conditioning units around the world today corresponds to two and a half times the electricity consumption of the whole of Africa. Estimates predict that the energy demand will have tripled by 2050. This is because, for instance, out of the 2.8 billion people that live in the hottest regions of the world, only eight per cent possess an air conditioning unit at present. According to the IEA's report, in order to quench the energy demand of the air conditioning units in the future, an amount of electricity equivalent to that which is produced in Germany and the USA today combined will be needed. Source: OECD/IEA, "The Future of Cooling"
European and international community have agreed to forego the use of refrigerants with a very high global warming potential as much as possible in future. Is it possible to get an entire sector to replace its materials in such great measure? Can such an ambitious climate protection goal be achieved? ■■ F-gases: Fluorinated greenhouse gases. Collective term for partially fluorinated hydrocarbons or hydrofluorocarbons (HFCs), perfluorinated hydrocarbons or perfluorocarbons (PFCs), sulphur hexafluoride (SF6) and nitrogen trifluoride (NF3). In 2015, 82% (by mass) of all F-gases in the EU were used as refrigerants. ■■ CFCs: Chlorofluorocarbons. A group of very stable gases that have a very high global warming potential and break down the ozone layer. Have been used as a refrigerant since the 1930s. ■■ HFCs:Partially fluorinated hydrocarbons, also referred to as hydrofluorocarbons. Are predominantly used as refrigerants, though they can also be used as foaming agents. Have been used as substitutes for CFCs, since they do not jeopardise the ozone layer. However, they generally still have a high global warming potential. ■■ Leakage: Refrigeration units lose refrigerants during operation through leaks, as well as during disposal. National greenhouse gas reporting estimated the emissions from refrigerants in stationary air conditioning units to amount to approx. one million tons of CO2 equivalent (2015 figures). CFCs – a danger to the ozone layer Such radical changes have already been accomplished once before: The Montreal Protocol succeeded in reducing substances that have been demonstrated to cause problems for the environment. In particular, this included CFCs , which at that time were used in great quantities as refrigerants, solvents, and in other applications, e.g. as blowing agents in spray cans. What was achieved back then with regard to reducing CFCs we are now aiming to achieve over the coming years with HFCs . Concerns were first raised about the potenti1974 al of CFC molecules damaging the ozone layer in 1974. Eleven years later, the existence of a hole in the ozone layer over Antarctica was proven (see page 6 for further information). Although CFC gases were identified as the cause of this, producers and the industry only reacted once politicians, scientists and environmentalists began to exert considerable pressure on them. F-gas regulation and Kigali amendment against HFCs Hardly any substances that are particularly harmful to the ozone layer are still emitted today. Yet the "substitute products" are showing side effects of their own. For instance, the reduction in CFCs is directly related to the significant increase in climate-detrimental HFC refrigerant emissions that occurred from 1990 onwards. While HFCs do not damage the ozone layer, they do still contribute to climate change. To counteract this, the European F-gas regulation came into effect in 2006 and was then replaced by an amended version in 2014, which has been in effect since 2015. This will gradually reduce the quantity of CO2 equivalent caused by HFCs to a fifth of the current quantity by 2030 (see illustration on page 5). Setting a standard: The Montreal Protocol An important milestone in all this was the Montreal Protocol of 1987. This document was initially signed by 24 states and the European Community. Over time, all 193 nations of the UN entered into the agreement and committed themselves to protecting the ozone layer. This common goal consequently united the UN in a way that had never been seen before. It was the first time that an agreement under international law to protect the planet had proven successful. able to be halted. And not only that – since 2000, it has been steadily going back down. The problem of the greenhouse effect was also recognised on an international level. Two years after the F-gas regulation was adopted in the EU, a significant reduction in the use of HFCs based on CO2 equivalent was decided upon at the 28th Conference of the Parties to the Montreal Protocol in Kigali, Rwanda. The conferences still take place regularly to review the results and negotiate any potential tightening of restrictions. Over the course of several years, the signatories observed the development of HFC emissions and ultimately agreed to take steps to reduce the amount to 15 to 20% of the initial quantity by 2047 (as opposed to the 2030 deadline set for the F-gas regulation). CFCs Chlorofluorocarbons HFCs Partially fluorinated hydrocarbons, also referred to as hydrofluorocarbons. The largest area of application for fluorinated greenhouse gases worldwide, in terms of quantity, is the use of HFCs as refrigerants. Consequently, this is examined in further detail throughout this document. F-gas regulation Regulation (EU) No. 517/2014 Resolutions Alongside international resolutions, German national regulations are also in place that address the matter of HFCs, such as the Chemikalien-Klimaschutzverordnung ("Regulation on chemicals and climate protection"). GWP Global Warming Potential, sometimes also referred to as "greenhouse potential". Measured in CO2 equivalent. of HFCs that are available on the market – measured in tons of CO2 equivalent (t CO2e) – and consequently a reduction in commonly used refrigerants on the market. The first phase of this has already begun: In 2018, only 63% of the initial quantity was available on the market. And by 2030, only 21% of this initial quantity from 2015 is set to be available on the market. Alongside this "restriction", additional bans are coming into effect. For example, the use of HFCs has been prohibited for various applications that exceed a specified GWP value. *Initial quantity: 100% = 183.1 million tons of CO2 equivalent. This corresponds to the average quantity of HFCs that were placed on the market between 2009–2012. Users must prepare themselves for the fact that as halogenated refrigerants become less readily available, they will increase in price too. Even in this early initial phase of the restriction, a price hike of up to 500% has already been observed since the beginning of 2017 (source: Öko-Recherche). Anyone who chooses to install a refrigeration system operated with refrigerants that may still be permitted today, yet will be heavily regulated in future, will have accept the potential economic disadvantage this incurs. The increased price of procuring the refrigerant is not the only factor, however: Users must also factor in the possibility of having to replace the system before the end of its service life, should it no longer be possible to service the system or if the substances required for operation are no longer available for replenishment. Furthermore, users should bear in mind that refrigerants are not all that easy to replace. An existing system can often only be exchanged for a more environmentally friendly solution at great effort and expense. Admittedly, there are "drop-ins" available on the market, i.e. refrigerants that can be used without the need for considerable changes to the existing system. These mixtures cannot be used universally or exchanged one-to-one, however. Anyone in the process of deciding on a refrigeration or air conditioning system today would therefore do well to select an option that can be used without issue in the world of tomorrow. 1. Refrigerants are becoming more expensive. 2. Refrigerants are no longer available. 3. Refrigeration systems need to be replaced before the end of their service life. Natural refrigerants It was 200 years ago that the inventor Jacob Perkins experimented with the development of a refrigeration device, presenting the very first vapour-compression refrigeration system in 1834. He chose to use ether as the refrigerant. About 40 years later, in 1876, Carl von Linde developed a refrigeration device of his own. In contrast to Perkins, he used ammonia as the refrigerant. The systems did work, yet the technology at the time was overburdened by the dangers posed by natural refrigerants: Ether burns, while ammonia is toxic. Consequently, fatal accidents occurred. CFCs: "Safe" yet ozone-depleting The first air conditioning systems appeared towards the end of the 1920s, while refrigerators and cold-storage rooms became ever more popular. "Safe" refrigerants began to be developed for this purpose. Substances were developed in laboratories that were non-flammable and safe to inhale. With chlorofluorocarbons (CFCs), an extensive group of substances emerged that could be used as refrigerants and were significantly easier and safer to handle. However, the stability that was desired in the refrigeration systems become a problem for the stability of the atmosphere. The CFCs were so stable that they could ascend to great heights intact, only breaking down once they encountered UV light in the stratosphere. The chlorine released as a result of this process began to damage the ozone layer. A phase-out of CFCs was introduced with the Montreal Protocol in 1987. HFCs: No ozone depletion potential , yet a potent greenhouse gas The search for new refrigerants began again. This time, manufacturers concentrated on chemically related substances. The properties that were beneficial for refrigeration systems needed to be retained; all that was required from the new refrigerants was that they did not damage the ozone layer any further. An alternative was found in the form of partially fluorinated hydrocarbons, also known as hydrofluorocarbons (HFCs). Only a few technical changes were required for the systems to be able to make use of these. Very little changed for the refrigeration engineers too â&#x20AC;&#x201C; all they had to do was adapt to an increased use of mixtures. As a result, CFCs were almost completely replaced by HFCs. Today, though, we know that these substances are still detrimental to the environment and not sustainable for future use, on account of the high global warming potential (GWP) they tend to have. Consequently, the use of these also needs to be heavily limited. What's next? Once again, we find ourselves at a turning point. A glance at the periodic table shows that there are only limited options for completely new substances. We are looking for refrigerants that do not harm the ozone layer, that have a low global warming potential and that are also safe and easy to handle â&#x20AC;&#x201C; but do these exist? The individual requirements often lie in conflict with one another. For instance, most substances that have a low GWP are flammable. It is likely that refrigerants could become more challenging to handle and may not be able to be replaced so easily this time around. The refrigeration and air conditioning sector will have to adapt itself to refrigerants with different properties and make use of different technology. Even now, it is apparent that the natural refrigerants are already in the process of gradually being "rediscovered", thanks to their more environmentally compatible properties. properties. R1234yf attracted criticism when it emerged that the substance releases hydrofluoric acid Burkhard Dunst, Frigoteam Handels GmbH during combustion, which can be fatal to humans. Furthermore, the breakdown product trifluoroacetic acid (TFA) cannot be filtered out of the water using conventional treatment methods. 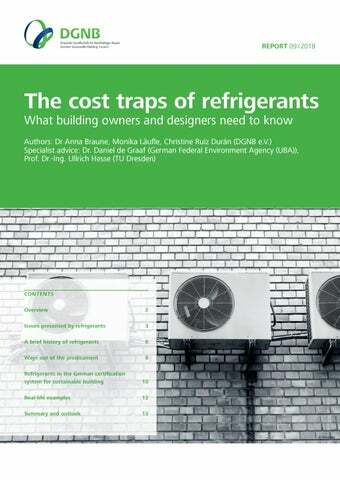 The experience has shown that newly developed refrigerants frequently cause new problems with consequences that cannot be foreseen at present (see illustration on page 7). It therefore makes sense to consider other potential solutions. An alternative approach: Construction initiatives and Building Sense Now Most buildings in Central Europe can be designed to forego the use of air conditioning systems. A glance at the energy demand and energy costs alone should be enough to raise the question of whether an active cooling system is really necessary. A passive cooling system, on the other hand, is possible in many new buildings. Cooling system arrangements can be implemented in existing buildings as well. simply cool down the temperature of the room by just a few degrees? Additionally, it's worth thinking about the bigger picture. Server rooms need to be kept cool – but does every company need its own server room? Would it be possible to store data externally in a cloud system instead, making use of data centres that already have an effective cooling system in place? Furthermore, the design should be adapted to the conditions of the regional climate. Do office buildings in hotter regions need to be completely glazed? Do surfaces in the city centre need to be sealed to such a large extent that they contribute to additional overheating? Architects and designers are in demand when it comes to developing solutions with regard to these matters and reducing the use of air conditioning systems to a minimum. To this end, the initiative "Building Sense Now" was launched in 2017. This aims to create an extensive network of like-minded architects, engineers and designers who champion building practices that are adapted to the local climate, culture and regional circumstances. Another option is to reduce the quantity of refrigerant used. In the coming decades, we will have to reckon with rising temperatures as a consequence of global warming. tion of the BNB system is being made mandatory increasingly frequently among public authorities. Alongside targeted regulations and recommendations such as the AMEV's "KĂ¤lte 2017", the BNB supports authorities in ensuring that less air conditioning (and consequently little or no refrigerant) is used in public buildings by means of its quality criteria. For instance, new constructions, conversions and extensions for government buildings must be designed such that room temperatures that are conducive to health can be adhered to in ordinary office spaces in the summer without the need for mechanical cooling systems. Air conditioning technology is only installed in exceptional cases where the need for a mechanical cooling system is absolutely essential. By taking the energy demand required for the cooling system and the environmental impacts that result from this into account in the BNB, there is an increased incentive to design the necessary air conditioning systems so that they can be operated with as little fossil energy as possible. The use of natural refrigerants is also positively assessed. The possibility that certain aspects of this assessment system will be intensified cannot be ruled out. For instance, it is conceivable in the DGNB system that the building owner confirms, by means of their signature, that they have been informed about the consequences by the designer. With this, they verify that they have knowingly taken into account and accepted the consequences (e.g. subsequent costs) should they decide to use a cooling system that will be heavily regulated in future and exclusively requires refrigerants that are hard to come by. In future, the environmental impacts of refrigerants (manufacturing, leakages, disposal) could also be factored into the life cycle assessment. 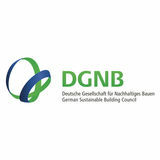 The fundamental system for evaluating the sustainability of buildings was jointly developed by the DGNB and the Federal Ministry of Transport, Building and Urban Affairs (BMVBS) in 2009. While the BMVBS has refined this basis so that it is precisely tailored to the self-assessment of government buildings, the DGNB has used it to develop a comprehensive certification system that can be applied to a wide variety of building types/uses and districts. The first three topics are weighted equally in the evaluation. This makes the DGNB system the only system to place equal importance on both the economic aspect of sustainable building and the ecological criteria. The scores awarded in the assessment are always based on the building's entire life cycle. Crucially, the DGNB system does not assess individual measures, but rather the performance of a building or district as a whole. The scope of the DGNB system's sustainability concept is broad and goes beyond the well-known "Three pillars" model. It comprehensively covers all the fundamental aspects of sustainable building. These encompass the following six topics: Ecology, economy, sociocultural and functional aspects, technology, processes and site. The DGNB awards its certificate at the levels of platinum, gold and silver. Additionally, existing buildings can receive the bronze award at a total performance index of 35% or above. There is also the possibility of obtaining pre-certification during the design phase. Both new buildings and existing properties can be certified according to the DGNB system. Taking refrigerants into account in the DGNB system Refrigeration systems and refrigerants have an impact on these four criteria of the DGNB system. ENV1.1 Building life cycle assessment This criterion aims to ensure the provision of buildings that produce energy and reduce CO2. Buildings cause emissions and in all phases of their life cycle. Using the life cycle assessment, all environmental impacts incurred and resources and energy consumed throughout the entire life cycle (i.e. from "cradle to grave") are calculated and summarised in the form of meaningful environmental performance indicators. One such indicator is global warming potential (GWP), which allows conclusive statements to be made about things such as the size of the building's CO2 footprint. Refrigerants are taken into account within the life cycle assessment criterion. One of the criterion's own indicators addresses "Halogenated hydrocarbons in refrigerants" and requires evidence of the refrigerant used with an indication of its GWP factor. A positive rating is given if none of the refrigeration systems used employ refrigerants with a GWP ≥ 150 in accordance with the schedule published by the German Federal Environment Agency (UBA) . Such refrigerants also include the substances that are still often used in building air conditioning systems such as R134a, R407C or R410A. Buildings that operate without an active cooling system fully comply with the requirements of this indicator, and are even awarded additional points for this. ECO1.1 Life cycle cost implemented without the use of halogenated or partially halogenated refrigerants. This criterion encourages a sensible and conscious approach to the use of economic resources. In addition to yields, the economic viability of a building depends on its cost-efficient operation. To this end, the life cycle cost calculation enables the medium-term to long-term costs to be taken into account. The criterion rewards optimisation of the life cycle costs during the design phase. The DGNB recommends analysing the use of refrigerants, as well as the possible conversion/ retrofitting costs or the use of alternative cooling systems. A positive result can be recorded if the building owner has decided against a cooling system that is dependent on HFC refrigerants and consequently spared themselves from the need for expensive retrofitting. This criterion promotes the use of passive system. Positive TEC1.4 – Use and integration of building technology marks can be awarded if – through corresponding architectural or construction measures such as shading, window area proportion, building orientation, storage mass, insulation standard, etc. (see page 9) – a passive cooling system has been designed and implemented and there is consequently no need for an active cooling system (i.e. an air conditioning system). Outlook: Climate-neutral building operation In May 2018, the DGNB published the first version of its framework for "Climate-neutral buildings and sites". This included a precise definition of what climate neutrality actually means, as well as establishing regulations for assessment calculation. Emissions from refrigerants in ongoing operation will be incorporated into the balance sheet in future as part of the framework. Real-life examples For almost every application, there are solutions with natural refrigerants already successfully in use. We will present a few of them here. Solutions that operate fully without the need for air conditioning technology are also shown here. Server room In its search for a fail-safe supply system that is as environmentally friendly as possible, the food logistics specialist Transgourmet opted for a cogeneration system that provides both electricity and air conditioning for the sever room of its new headquarters in Riedstadt. This system consists of two cogeneration units and three LTC 30 e plus InvenSor adsorption chillers with free cooling function that work in parallel and have an overall cooling capacity of 90 kW. The new energy centre reduces the energy consumption of the business by approx. 110,000 kWh per year in comparison to electrically operated cooling systems and exclusively uses water as a refrigerant. Cooling prize These real-life examples originate from manufacturers such as InvenSor and Frigoteam. Both were awarded the "Kältepreis" (cooling prize) from the German Federal Ministry for the Environment, Nature Conservation and Nuclear Safety (BMU) in 2016. Summary and outlook The refrigeration and air conditioning sector is about to undergo a radical upheaval. To continue to rely on climate-detrimental refrigerants is no longer an option. More environmentally friendly and sustainable, future-proof methods are required in order to operate buildings in a way that is thermally convenient. The Montreal Protocol has shown that it is possible to successfully implement binding agreements on a global scale and transform an entire industry. The same can be achieved with HFC refrigerants. The key question is: Which substances will become the future standard for refrigerants? Do we want to simply count on the idea that the chemical industry might yet develop a "miracle solution" combining all the positive properties without any negative consequences for the environment? Instead of working on that basis, it would be better to fall back on triedand-tested climate-friendly alternatives. Natural refrigerants, for instance, have already proven themselves on the market for many years now. Indeed, when used in thermal pumps, they have the potential to reduce greenhouse gases, provided these are operated with renewable energy sources. With natural refrigerants, we have a selection of refrigerants at our fingertips that have low GWP and properties that have been well researched. And with modern technology, we can even manage the risks associated with these, such as flammability or toxicity. It's true that non-flammable refrigerants will be required in some systems, yet these are the exceptions. Almost everywhere else, it is possible to forego the use of cooling systems that are operated with refrigerants that are detrimental to the climate. Even better would be to do away with mechanical cooling systems entirely, and put an end to our dependence on refrigerants, energy prices or availability. The F-gas regulation gives us that chance. It forces us to critically question the use of refrigeration and air conditioning technology. An air conditioning unit is not necessarily needed to create a pleasant indoor climate; the same effect can often be achieved just by using well-conceived construction initiatives and passive solutions. Those beginning construction now have the best starting conditions, yet even in existing buildings, there are possibilities to implement such changes. And to this end, the services of designers and architects will increasingly be required. and districts, which helps to increase real sustainability in construction projects. This means that the DGNB system is based on an integrated understanding of sustainability that incorporates the environment, people and the economy in equal measure. Additionally, through the DGNB Academy education and training platform, more than 3000 people in over 30 countries have already been qualified as experts in sustainable construction. All rights reserved. All information has been prepared and compiled with the utmost care. The DGNB assumes no liability for the accuracy or completeness of this content or for any changes that may have occurred since its publication.